The bank called to ask whether I’d tried to spend $800 at an online casino. Luckily they guessed the chances were slim. Now thanks to my entire lack of a contingency plan (and my only credit card being a UK one), I have little choice but to start making the most of free stuff NYC has to offer. Thankfully there’s a lot of it. 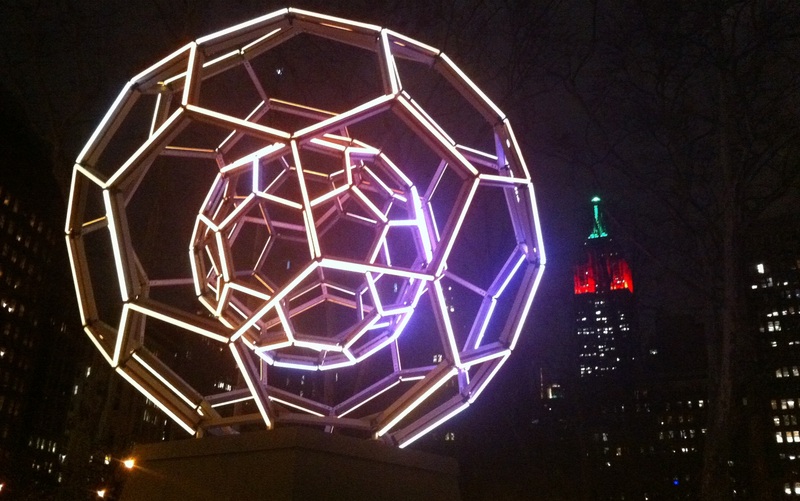 Tonight I went to one such freebie – the ‘Buckyball’ installation at Madison Square Park. This massive geometric sculpture by Leo Villareal is made up of 180 LEDs that form hexagons and pentagons that glow and change colours. It can display an amazing 16 million unique colours, bringing science and art together to light up the park. And as my friend Meghan pointed out, with the Empire State Building emitting its own neon rays behind, the installation allows a meeting of the old with the new. That’s New York, and something I’ll bet never changes. Well, you know, if I could.